I will pick you up at any Montreal location of your choosing. 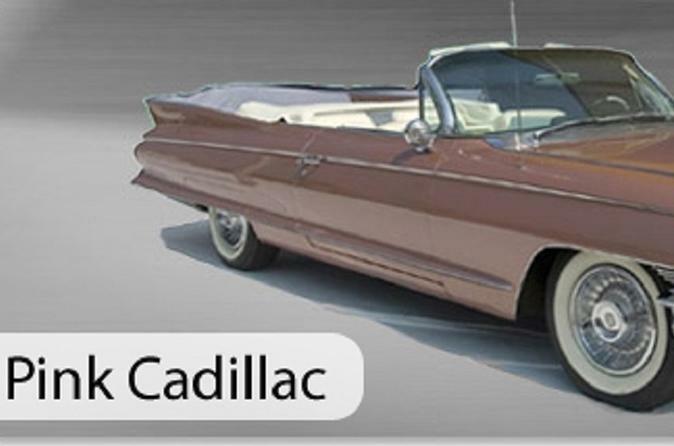 We will be traveling with an original 1960 PINK CADILLAC convertible automobile.and walk according to your desires.. Tour includes Old Montreal with all highlights, downtown, Westmont with multi millions dollar houses and Mont-Royal look out.Quick stop in underground city. In Montreal, you have to go through a special course and a test to have a guide permit from the city. I have my permit and will explain all our history on top of showing our beautiful city. Montreal has 4 million people and have a very low crime rate. First I will explain history of first French regime than British regime we had here. In old Montreal we will drive through narrow streets were many movies were and are made. Stop at Jacques Cartier square, Place d'armes square in front of Notre-Dame Basilica with it's unique, beautiful interior and huge organ where theme music of last Star War movie was made. Smallest square : The gossipers square. Jean-Paul Riopel square, oldest street in Montreal : St-Paul street. In the downtown we will drive through '' Golden square mile'' , McGill University. Fine art museum that will take us to Westmount where Tomy Hill figer, Mikel Dougles and more celebrities own multi millions dollars houses. Than on to Mont-Royal. A 400 acres of wild forest in the middle of our city. A big park design by a famous American '' Frederic Holmstead'' and a stop at the beautiful look out with explanations of what we will see. We have what we call an underground city where you can walk for 22 miles without walking at the same place ( We'll only do a quick walk in it ! ) We have more than 100 ethnic group in Montreal living in peace, They all have at least one restaurant. I will suggest a few restaurant according to what you like.